Google Play Store is a vast collection of android apps. We spend most of the time in downloading apps from this store. But sometimes you may see an error message in play store that indicates that the app can’t be downloaded due to some issues. The error message returns an error code which is a three digit number. 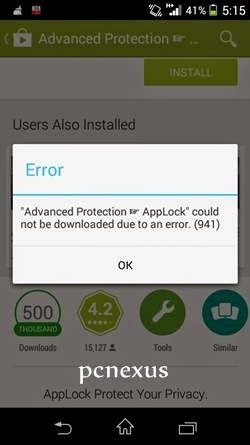 These errors prevent download and installation of android apps on your android smart phone from Google Play Store. In this tutorial I am going to teach you how to resolve play store error 941. The error 941 can occur on any android version including gingerbread 2.3, ICS 4.0, android jellybean 4.1, android kitkat and probably android L. This error is not handset dependent and can occur on any android phone from Samsung, LG, Motorola, Sony, ASUS or HTC. But don’t worry I am going to tell you a permanent fix for Google play error 941 and I have previously managed to fix and resolve the error 927 that helped many users fixing the problem. This error is basically caused by following reasons. To fix this error fix the problems given below. 1. Data Connection : Internet data connection of your smartphone can cause this error to come up on your phone’s screen while downloading apps from play store. It happens if suddenly the data network disconnects. So make sure that your phone’s internet connection is in working state. If error occurs then restart your phone’s internet connection. 2. Clear Phone’s & App Cache : If your phone’s cache is full then this can cause this error. Because there is no much space left for play store’s new cache that needs to be stored on your phone. You have to clear the application junk files and cache. Use clean master app for this purpose. Also you should clear app cache of two apps ‘Google Play Services’ and ‘Play Store’. Go to ‘Settings>Apps>Downloaded’. Here find the above two apps open them and tap ‘Clear Data’. It will reset app to default state and clear all errors. Note: If ‘Clear Data’ button is unavailable in Google Play Services then go to ‘Settings>Security>Device administrators’. Uncheck android device manager then clear its cache. After clearing cache enable android device manager. 3. Keep Google Play App Updated : Keep the app updated to its latest version. 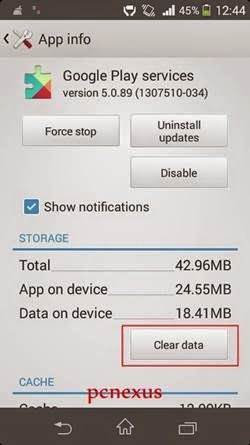 The play store app automatically downloads its latest update in background when data connection is enabled. So let this app to update itself by enabling mobile data network and eave the phone idle for ten minutes. Just open the app and it will be updated. After following the above given fixes you will be able to resolve Google play store error 941. If you any queries then feel free to ask via comments. I purchased a new LG K10 phone a couple of weeks ago. Last week, I got my first notification of Apps that need to be updated - however, I got the 941 Error Code. I looked this code up online and have followed all the steps to fix the code - including the steps listed here - but I'm still getting the error and am unable to update any of the Apps. (Side note: the app's that I installed on the phone, such as Facebook, Runkeeper, etc, are updating with no problem). PLEASE HELP!! Please update the Google Play Store app. 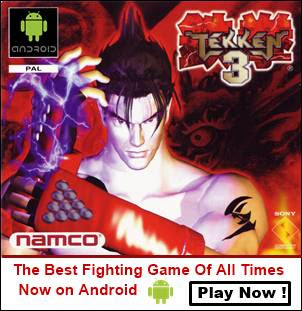 You can download the latest apk and install it on your phone. Search in Google for the apk.